What is the Perfect Family? This is the subject of a series of coursework essays by Roxanna Baez, which are interspersed through the chapters of "Look for Me". The essays within Look For Me tell the story of Roxy's family from her point of view. The trials of her mother's alcoholism, the horror of foster care for her and her sister, and their painful separation from their brother are all revealed — as is the hope for a normal family life. Only two of these chapters have been ‘handed in’ when Roxanna's family home becomes a crime scene as she has gone missing. The police have to employ some unorthodox methods in order to find her. In charge of the police investigation is Boston Sergeant Detective DD Warren, a determined and conscientious cop. She is not overly happy when she discovers that Flora Dane has taken an interest in the case. Flora (whose story is told in Find Her) is a survivor and has set up a network to help others to cope after traumatic experiences. Nevertheless, Warren recognises that Flora may be able to ask, and get answers to questions that the police couldn't; and in so doing the two develop an uneasy tacit agreement to work together. 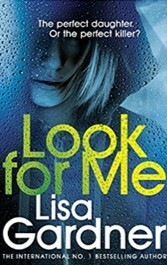 Look For Me poses some difficult questions with regard to children's welfare. Is taking children into care always in the best interests of the child? With social services so stretched, are there sufficient checks on foster homes? Fear, love, total emotional upheaval and the consequences for vulnerable youngsters are all explored in the narrative but never at the expense of the gripping storyline. It has been a while since I read a Lisa Gardner book. Reading this one means it certainly will not be the last.